Pokey and I on set for my segment on painted batting. My episode is going to be 213, the last one of the season. 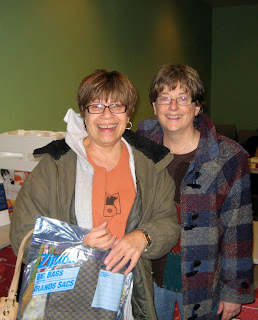 The Quilting Arts staff are a health concious crew. Helen Gregory (editor) and Pokey are taking a break in the green room getting their antioxidents. 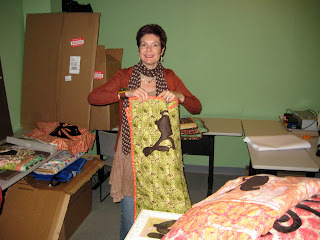 When I got to the studio Shelly Stokes from Cedar Canyon Textiles was getting ready to head out the door. I hung out with Jane Davila on Monday afternoon and we watched Pokey change in and out of clothes and tape short segments for the different episodes. I can't believe I didn't get a picture of Jane while she was there. Heidi Lund had been there briefly Monday morning before I arrived. 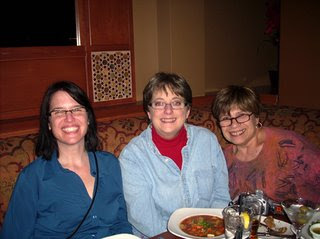 Claire Fenton, Rayna Gillman and I had a great Lebanese dinner, it was fun catching up it had been way too long since our last time together in Houston several years ago. Rayna and Claire stopped by on their way to the airport tuesday morning, they just couldn't stay away. Katie Pasquini Masopust flew in, taped her episode and left while I was upstairs in the studios taping something else, I never even saw her. I think she was hoping to avoid weather problems and got out while she could. The midwest got hit with a big storm later in the evening with high winds and blizzard like conditions. Tina Givens came on tuesday afternoon. Tina has just designed her first line of fabric for Westminster. Things were busy with people coming, unpacking, taping, packing up again and heading out. It is amazing how much is accomplished in such a short amount of time. Everyone over at Beechwood studios are great to work with, they really help you to feel at ease. The show is really coming together, the segments for the second season are longer with lots of interesting guests, I think it is going to be great. You can read Pokey's latest on the QATV show taping on the Quilting Arts blog. Recognize those unmistakable O's on the windows? 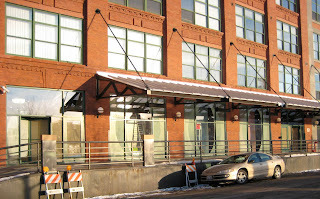 Thats right Oprah is opening a new store across the street. 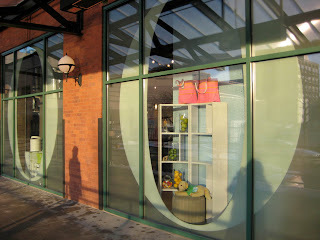 We took a sneak peak in the windows. It looks like it will be filled with all of her favorite things. We could see shelves of fluffy towels, tea pots and sweaters with a stuffed retriever in the window. It looks like they are getting real close to opening. They just pulled the paper off the windows over the weekend. I was hoping there would be a little coffee bar and sitting area for book groups to meet next to shelves filled with Oprah favorites, but I didn't see anything like that. I guess they don't want the neighbors hanging out all day sipping cappucinos over heated book discussions. 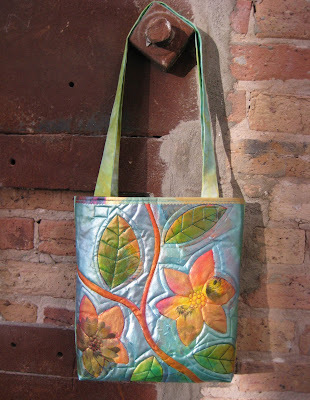 After this hectic month, I am now packing my bags to fly to Ohio to tape another segment on QuiltingArts TV. I will be back on Wednesday and will have photos and news to share. Once this next week is behind me I should be back to blogging regularly again. 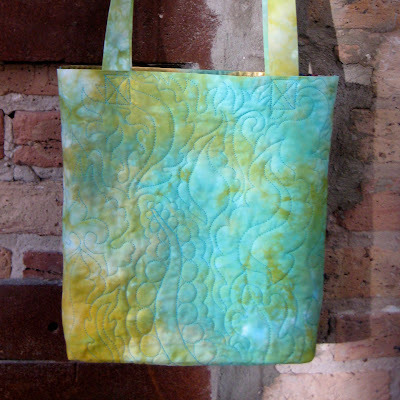 I made this tote from some collaged and painted fabric that I made. It is the same technique I used for making the fabric for the houses. There will be an article on making this fabric in the April/May Cloth Paper Scissors. I bit the bullet and bought a custom domain and set it up according to what Blogger says to do and screwed it all up. That is why my blog has not been available the last day or so. I was scared I had lost it forever! The frustrating thing about Blogger is there are no live tech people that you can easily talk to about fixing a problem. The tech support over at godaddy.com has been great. I have called several times trying to fix the problem even though it is really a problem I was having with blogger. The last guy I talked to solved the problem for me by telling me I actually do not to do anything on blogger to switch over that it is all done through them. So I reversed my custom domain switch on blogger and got my blog back. Blogger makes the whole thing very complicated saying you need a CNAME, but you don't. Just listen to the tech people where you buy your domain name, do not follow the blogger instructions! now you can type in that or my blogspot address to get to my blog. 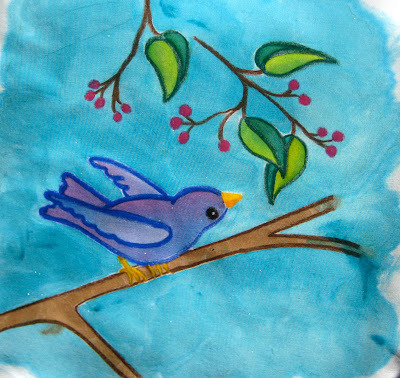 Neocolor crayons can work as a resist! Last night as I lay in bed with total insomnia trying to solve the worlds problems, or atleast my own, a lightbulb went off. In my brain anyways, it occurred to me, if you heat set the crayon drawing first, the wax would melt into the fabric creating a resist. I just did a quick little test and lo and behold it works! Draw your design on the fabric, put a press cloth on top and iron it at the setting for the fabric. 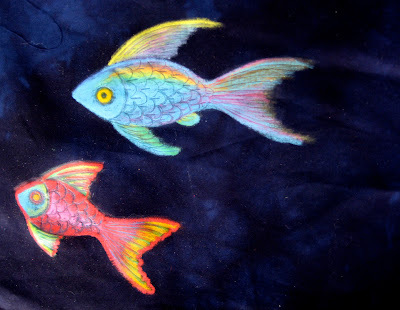 Then use transparent textile paints with a lot of water mixed in as you paint. You could do lots of watercolory blending of colors and throw salt on it to get more texture as it dries. I have been reading this beautiful book. 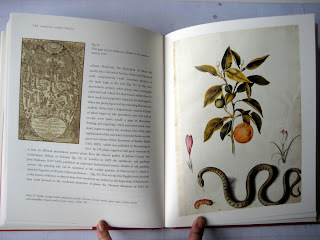 It is an historical overview of scientific illustrators between the late 1400s and the mid-1700s. 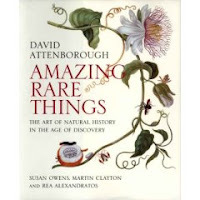 This book is filled with illustrations of plants and animals by many different illustrators of these time periods and there are more in depth histories of Alexander Marshal, Maria Sibylla Merian and Mark Catesby with a chapter in the beginning on Leondardo da Vinci with many of his beautiful drawings. 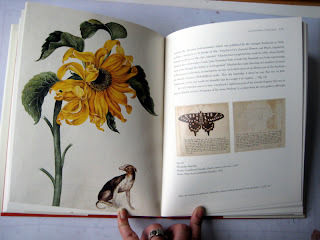 My favorites are the illustrations of Maria Sibylla Merian (the late 15th century), she lived and worked in a time when it was rare for a woman to have a career and travel alone to exotic destinations. 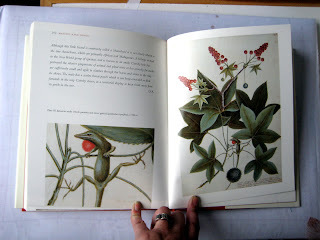 Her paintings of insects and plants are just gorgeous. 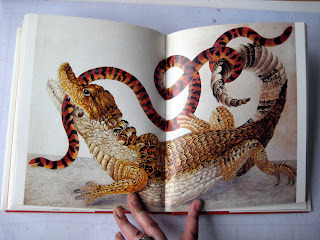 I love the colors and textures on her illustration of the caiman. Sorry about the soft focus on the photo. I spent some time playing with Cretacolor aquastics the other day. 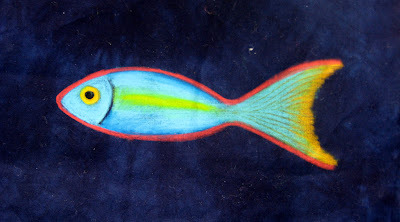 These oil based water soluble crayons color beautifully. They are creamy smooth and vibrant, the color literally glowed on the dark blue fabric. The interesting thing about these is that you can color one color solidly on top of another and then scratch away the surface to reveal the color beneath. This technique is called sgraffito. The downside to these crayons- they are NOT fixable. I tried letting them sit for 24 hours and heat setting them with an iron and they were still water soluble. 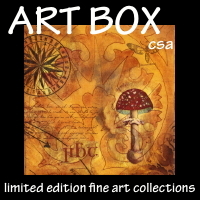 So they are probably not well suited to fiber art because of the delicacy of the surface. I think these are best to use only on paper. 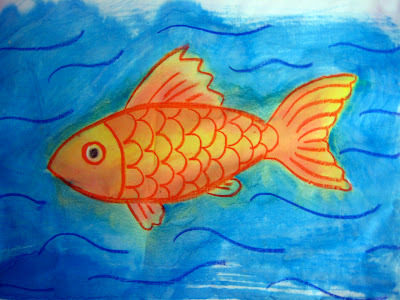 Next I tried the Neocolor crayons, these were as vibrant, and smooth as the Cretacolors but they are not water soluble. They are a wax based crayon, that held up well to the iron. On white fabric I noticed no difference in the color vibrancy. On dark blue it did loose a little of the brightness as the wax melted into the dark fabric somewhat, but it still looked good. So I think I would try these for possible work on fabric, although I have not sewn on it yet, I love the way it looks. This was another experiment to see if the Neocolors might act as a resist, like batik, by drawing on the fabric and painting over it. There was a little bleeding but it doesn't bother me too much, I like the playful quality of it. So I think it is a good medium to use with paint. 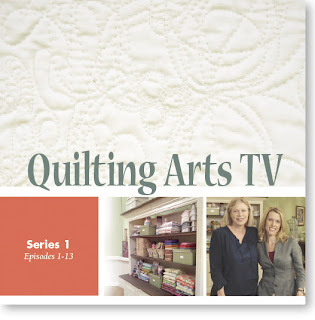 Quilting Arts TV on DVD! Wow for everyone who is not in the US or who has a lame PBS station that is not fiber friendly, you will be able to buy the whole first season of Quilting Arts TV on DVD. I know QATV is not showing up yet in the Chicago listings. I looked through the next 2 months schedule of Create with no sign of it there or on the regular PBS station site. 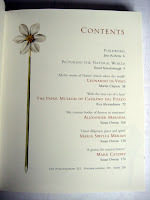 Have you seen that Quilting Arts is also coming out with a new special Studios issue. I submitted a few photos for it. I love seeing how people organize their studios, I admit I can be organizationally challenged. I am the kind of person who usually shoves the big pile to another part of the table to work on the next project because I don't want to waste time putting stuff away and then not be able to find things. My mother would tell you this is a life long pattern for me. It is amazing how much Quilting Arts has in the works right now. Lots of special stuff to come out soon. 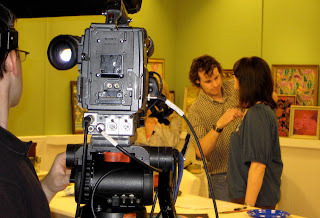 At the end of the month Pokey starts taping the second season of Quilting Arts TV. I will be taping a segment for the second season too, only this next one will be longer than 3 minutes, lol. I will be painting batting and demoing how I made the 9 patch that The Warm Co. used in their ad in the December issue of Quilting Arts. So if I don't post as often this month it is because I am busy working on my step outs for the show and a couple classes I am prepping for.